In an otherwise feature-less field, just south of Calgary’s sprawling metropolis, sits an object so out of place from the rest of its surroundings it’s almost as though it was dropped from the sky. 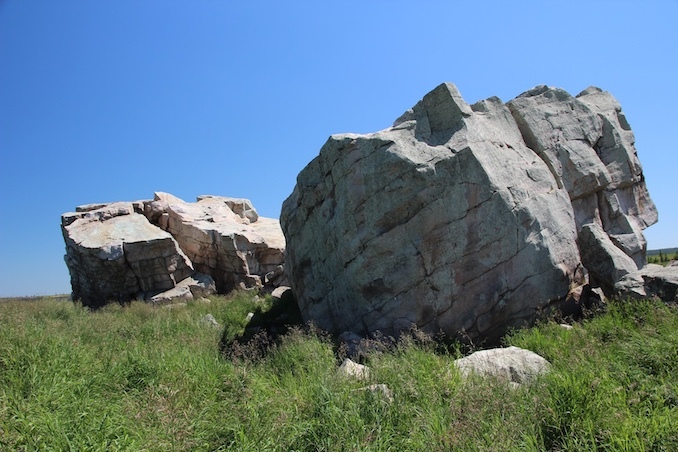 The Okotoks Erratic, better known as the Okotoks Big Rock, is a massive quartzite block that weights roughly 16,500 tonnes. Surrounded by rolling prairie, it would be easily assumed that this boulder was an alien rock from outer space. But with the absence of any impact crater, this unusual stone appears to have been gently placed on the Earth’s surface as opposed to crashing into it. The Okotoks Big Rock did not arrive from beyond our galaxy, in fact it originated from somewhere within the Athabasca River Valley in what is modern-day Jasper National Park. 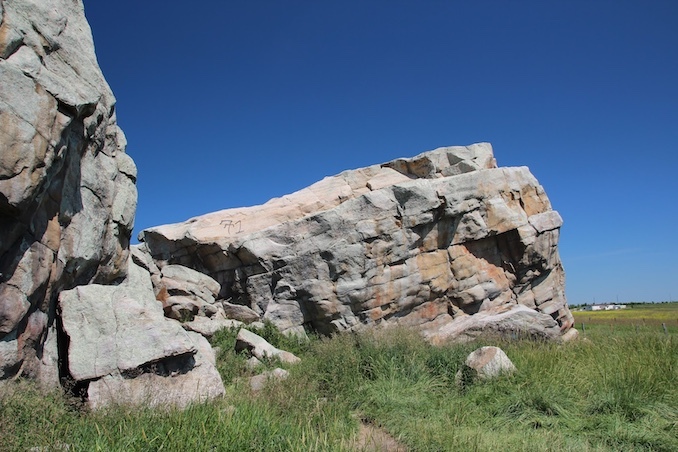 The Big Rock is a glacial erratic, a name given to all rocks that have travelled many kilometres from their original locations on the surface of a glacier. Somewhere between 10 and 18 thousand years ago there was a landslide that dumped an untold amount of debris on top of a glacier. The glacier then carried this accumulation of rock southward towards northern Montana. As the glacier slowly receded, it deposited the rocks across the landscape. The rocks were abandoned in a narrow strip along the foothills that extends for 930 kilometres between Jasper and Montana’s northern border. 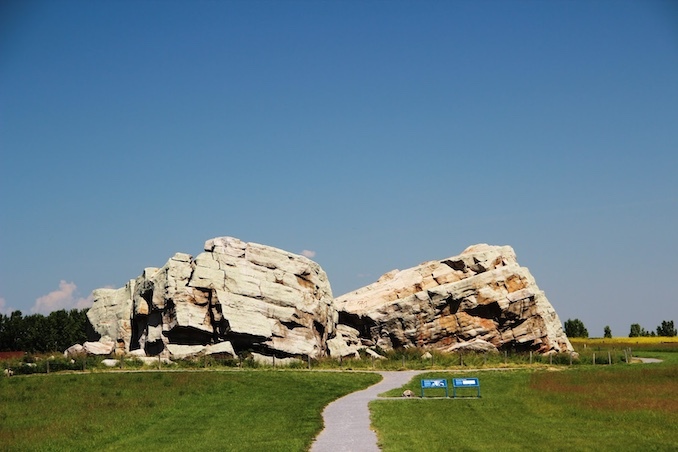 This slender band is known as the Foothills Erratics Train and contains thousands of rocks and boulders of varying sizes, with the largest being the Okotoks Big Rock. The rock stood out from the surrounding flat prairie, which made it visible from great distances. Early First Nation groups used the boulder as a landmark to find the crossing over the Sheep River. 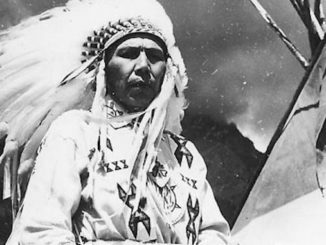 The rock and surrounding area both have great cultural significance to the Blackfoot People. 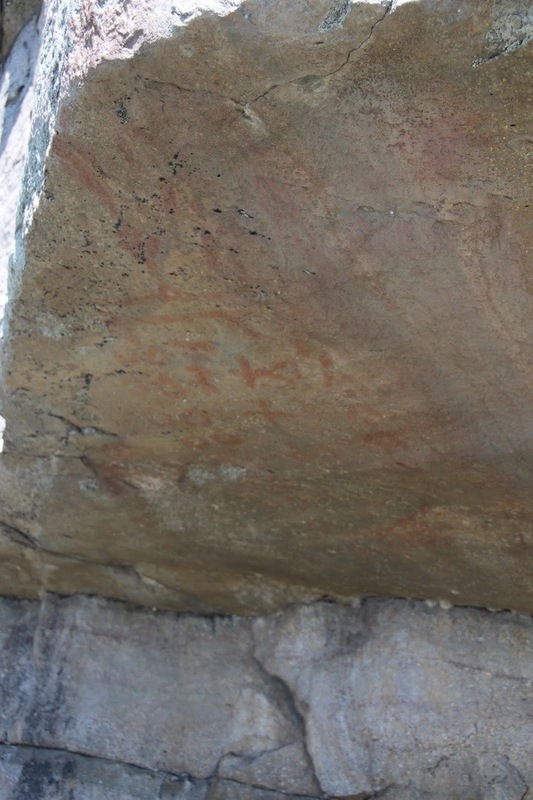 At one time there were dozens of pictographs painted across the rock’s surface, but time, weather, and vandalism have all but removed them. 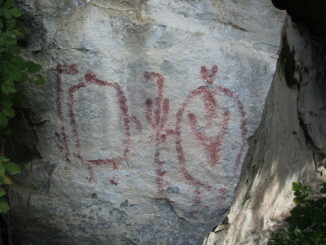 If you know where to look you can still see some of the faded rock art, but they are very difficult to decipher. Okotoks even takes its name from the Blackfoot Word for rock, ‘okatok’, which could be in reference to the town’s proximity to the erratic. 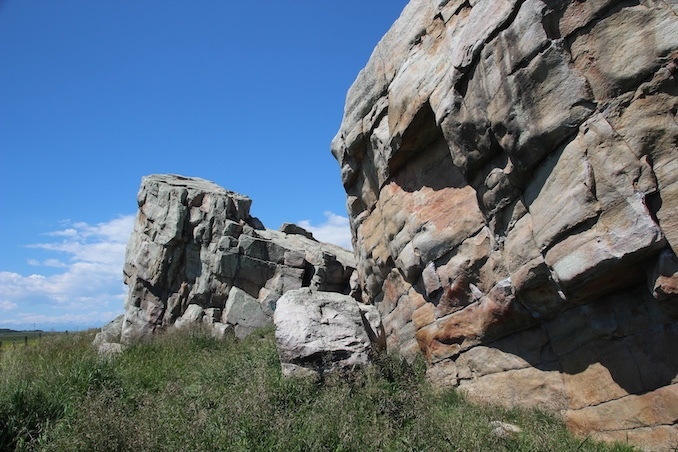 In 1978 the Government of Alberta declared the Okotoks Erratic as a Provincial Historic Resource in order to protect both its geological and cultural importance. The Big Rock is easily visited today with a short drive from Calgary. There is a parking lot, complete with bathrooms, and the trail to the rock is accessible to everyone via a paved ramp and then a well-graded packed gravel trail. The erratic is roped off, but that hasn’t stopped many people from crossing the barricade and climbing all over it. Please respect the site, and the ancient artwork, but avoiding the temptation to scale this natural feature. After visiting the rock why not stop by the Big Rock Brewery, a local craft beer company that was founded back in 1985 and named after the Okotoks Erratic. I recommend the Grasshopper, with a squeeze of lemon. It’ll quench your thirst as you reflect on the day’s adventure.